So called "natural background radiation" stands at 2.2 mSv now in the UK which is below the world average of 2.4 mSv. However, when you consider that this has increased from 0.2 mSv over six decades due to the combination of military nuclear test, nuclear power stations and medical radiation equipment, then the increase in medical radiation will be enough to cause concern. The definition "natural background" will have to be redefined. Preliminary results from the new UK national CT dose survey have provided some details about the scale of the modality's continued proliferation, as well as the increasing exposure of the population from the rising number of examinations. The results were presented at last week's UK Radiological Congress (UKRC) in an electronic poster that proved to be the most popular exhibit during the congress in Manchester. 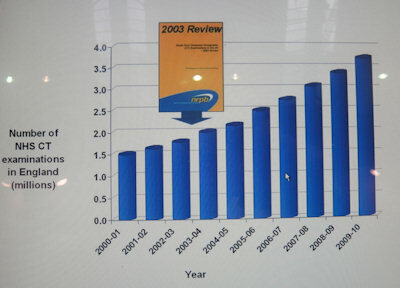 CT referrals have increased year over year, as shown in the chart for England. In the UK, about 68% of the population dose now comes from CT, whereas CT accounts for only 11% of total x-ray examinations. The per caput CT dose in the UK is less than five times the equivalent figure for the US, but in the UK there are typically 56 CT examinations per 1,000 people, rising to 223 per 1,000 in the US. 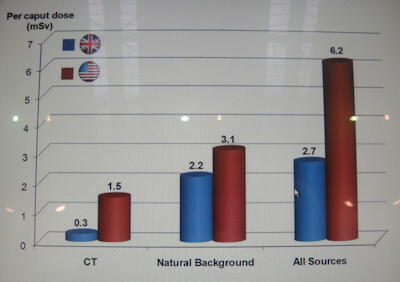 Per caput doses in the UK and US from CT, natural background radiation and all sources. 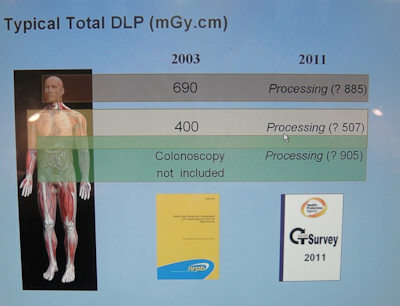 Typical dose length product (DLP) data for head CT, chest CT, and CT colonography are shown in the graphic below. Based on data received so far, rises in DLP for both head CT and chest CT have occurred. The USA hold the world records in incidences of heart disease, cancer, diabetes and others. Could there be a correlation between those and the world's highest "natural" background radiation and radiation from all sources? Japan will take the top spot in "natural" now. Studies conducted in 5 or 10 years time will show the increase in diseases. They will show the damage caused to DNA of the Japanese population leading to the extinction or near extinction of a genetically distinct race. We can then draw conclusions regards the spread of radiation around the globe caused by Fukushima's reactors which will still be emitting radiation in ten years time and beyond. Scientist belonging to anti-nuclear campaigns claimed a decade ago already that the US became the world's most dangerous place to live in when the "all sources" radiation load exceeded the Chernobyl stricken Ukraine and reached 3.5 mSv. This stands at 6.2 mSv now, twice the UK level. You cannot avoid background radiation but you can avoid medical radiation. An average CT scan will load you with 7 mSv, it's like taking part in a voluntary euthanasia program. You won't drop dead immediately, the official mortality rate is one in a thousand, but your DNA gets damaged and the consequences of this will never be officially attributed to radiation. Chromosome - DNA - Gene. Using metaphors the chromosome is a page of a book, DNA are the sentences and Genes are the words made up of 4 letters each. A nucleide hits a gene, it destroys or changes the 4 letters, as a result the sentence (DNA) no longer makes sense and the page (chromosome) looses its meaning. About 3% of DNA is mapped in the Human Genome Project. This DNA is the building block of the physical body, the RNA and Proteins. Damage to this is verified by allopathic medicine. About 97% of DNA is not mapped. It stores the information for every cell "how do I function - why - and for what purpose - when and for how long". How else could a cell know that it is a cell and what it is supposed to do as such?